Baldwin Baby Grand M 5’4″ (VIDEO) Ivory Brown 1961 Refin./Refurb. 2014 $3,950. Classic hand crafted American Made Baldwin Baby Grand Piano, 1961, low mileage, recently refinished Ivory/Light Brown, refurbished 2014. Our technicians and furniture people have gone over this one and she looks and sounds great. Excellent condition all original Baldwin parts. Action very responsive.Warranty. Free LI/NYC delivery. All else continental USA only $475. ground floor delivery. Questions? Speak with Sonny 631 475-8046. Mason & Hamlin Grand Piano Model A made during the “Golden Era” of Mason & Hamlin manufacturing in Boston. this one was refinished and rebuilt about 20 years ago with new pins, strings, dampers, new key tops, hammers, shanks and wippens, regilded the plate and revarnished and reinforced the sound board. Has the patented Mason & Hamlin Tension Resonator. Also refinished ebony gloss. Our technicians just went over it and our furniture people buffed up the finish and now she plays and looks great. Steinway A Grand Piano 6’1 1891 85 Keys Very Good Condition Inside & Out! Remarkable Steinway A Grand Piano 6’1″ new Steinway hammers, strings, pins and dampers put on a while back, also refinished at the same time to a high gloss finish, our technicians just regulated the action and voiced the hammers and our furniture people gave it a French Polish so it looks and sounds great. Lots of life left in this piano, soundboard is in great condition with only a couple of shims, pin block tight with 4.0 pins. Here is a Art Case Hamburg B that was made in 1902 and was originally sold by Harrods of London. It is in pristine condition both inside and out. The ornate case is called “Marquetry Style” according to Steinway NY records. It appears to have been rebuilt with a Steinway Action over the past 20 years with very little use during that time period. The soundboard is in excellent condition without any apparent visible cracks. The action is very responsive and it sounds like a beautiful, sublime Hamburg B. The owner is a high end piano tuner technician rebuilder that maintained the piano and did the rebuild. MARQUETRY DEFINITION: decorative artistry where pieces of material (such as wood, ivory or shell) of different colors are inserted into surface wood veneer to form intricate patterns such as scrolls or flowers; found in furniture or decorative accessories made of wood. Magnificent Steinway Model D that was made in 1918 but went to NYC Steinway Restoration Center for twice once in 1932 then back again for more work in 1936 according to Steinway Records. Recently a new Steinway action was installed and the belly work was done again (strings, pins, dampers, plate painted and board re-varnished. The owner is a retired high end tuner technician that was both a pianist and worked for rich & famous taking care of their pianos. After some close scrutiny we determined that the board was replaced probably with one of the original rebuilds or more recently as it is in perfect condition with no cracks. The Belly work looks like it was done about 15 years ago and the Steinway Action looks like it was put in over the past few years as it also looks like new with barely any grooves in the hammers. The owner apparently installed the action and did the belly work as well. It all appears to be in excellent condition. The finish is a little rough in places but can be cleaned up or refinished again to be perfect. The piano has a very rich tone and very responsive action. Questions? Speak with Sonny at 631 475-8046. 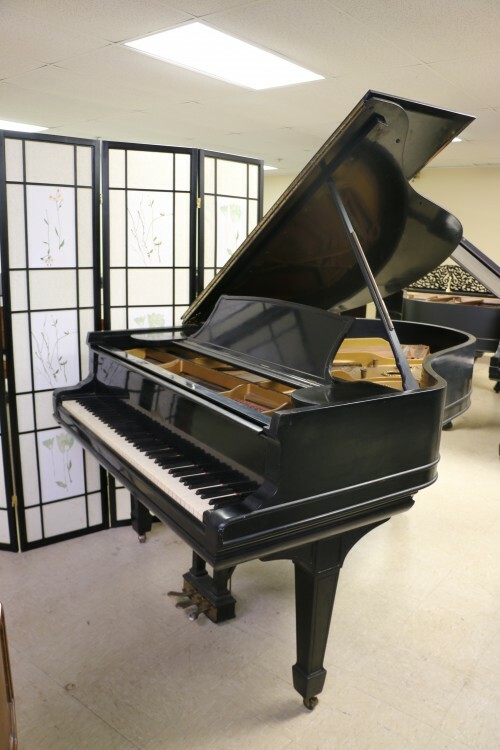 Kawai Baby Grand KG1 Ebony 5′ 1974 $4,500. Steinway B 6’10.5″ Circa 1900, just totally rebuilt, with gorgeous new matte ebony finish. Brand New Alaska Sitka Spruce soundboard, new Mapes Bass strings, German Roslau Steel Strings, new dampers, new pin block, bridge caps, re-gilded plate. Like New Steinway NY Action just installed only about 10 years old taken from another Steinway B that the owner wanted to install a Renner Action into. Cast Iron Plate was made by Steinway in their own Steinway foundry unlike all Steinways made after WW 2 these plates up to today were/are made by other company’s not Steinway. Seasoned wood case and plate made when teinway Made in 1896 when the Steinway Family was still running factory on day to day basis. Warranty. Qutions? E-mail or call Sonny at 631 475-8046 or sonnyspianos@gmail.com.